What to do with an advertisement like this? I recently viewed Ikea’s “the future of Scandinavian design” commercial that features a brief (link here), one minute composition of images that left me questioning what I had just witnessed. I wanted to pass on the advert, but felt there was so much intended, sacred meaning attached to the commercial, I couldn’t stop thinking about what I had seen. With the framework of an ancient cosmogony, a few Jungian texts, and other scattered books, a potential message presented itself to this researcher. No, it isn’t quite Pythagoras, but rather a potential mentor of Pythagoras by the name of Pherecydes of Syros. More information on this figure, which surprisingly, has very little literature available for purchase on the main book vendor sites (at least at reasonable prices) can be found here. I’ll return back to this paradigm once the analysis of the commercial’s symbolism is complete in order to make sense of the material (at least so that it attempts to makes sense to me). Getting back to the task at hand, let’s now review the commercial. The commercial, at a brief 1:02, is beautifully constructed and flows wonderfully with the sparse music that accompanies the imagery. The commercial begins with the camera image zoomed in, and upside down, on a glass sphere/ball that is rolling toward the camera. As the camera expands away from the ball, the camera is flipped right side up, and highlights the ball traveling across a wood parquet herringbone floor. The imagery at this time also highlights three, white, spare rooms with sunlight flowing in from the right side of the image. After setting the ball/sphere as the focus point, the camera then pans to a side view of the ball. The glass sphere is seen moving from left to right, and is possibly the third room/chamber, with three windows facing the sun. As the ball proceeds across the floor, the camera now moves back to the first room (from which the ball originated), and features a white monolith. As the sun begins to fade into dusk, the white monolith slowly begins to melt into the floor, until the room is dark and the monolith is no more. Upon the disintegration of the white monolith, the camera now moves to what is possibly the fifth and final room the glass ball is traveling too; here, we again see darkness. The wooden parquet floor ruptures, cubic forms are scattered, and from beneath the floor, a rattan coil rises into room above it like a slowly revolving serpent. As the glass sphere continues to roll toward the final room, we then see a spool of wool thread, featured as Ypperlig, unwind from a spool. As the sphere continues moving forward, the thread floats into the air behind it, and creates a large, possibly wool scarf that floats, hauntingly, in the air behind the sphere. With the floating scarf slowly rotates in the air, the camera image fades away. Once the screen is dark, we finally move to the end scene wherein we again see the lonely, spherical glass ball rolling, slowly, from left to right, headed toward, we assume, from the room with the white monolith to the final room containing the rattan coil. Brief, and to the point, this fantastic Kubrick-eque commercial hopes the viewer is to become curious about the future state of Scandinavian interior design. Ikea’s hope, of course, is that you will not only be curious about the future collection, but that you will spend one’s hard earned currency for material goods to furnish one’s home. The glass ball rolling along the floor, moving left to right on the screen, is an interesting object to attach the viewer’s focus and attention to. Yet what could it possibly be representing? Beginning with German psychoanalyst and dream symbol researcher Dr. Holger Bertrand Flöttmann research, the glass sphere “represents femaleness, the Great Round, the Great Mother and fertility.”1 The Great Round and Great Mother are interesting constructs in and of themselves. Jungian Erich Neumann, in his book The Origins and History of Consciousness, attaches to the idea of the sphere (and circle) as equivalent to the philosophical World Egg. The sphere carries with it the construct of the Self Contained, and with it represents both the “nucleus of the beginning” and the “germ from which…the world arises.”2 The sphere contains all opposites and represents perfection; there exists no feminine/masculine, good/evil within the Great Round. The Urobous is the most ancient deity in the prehistoric world and known as the All One; the Babylonians referred to it as the Heavenly Serpent, the Greeks referred to it as Leviathan, Aion, and Oceanus. It is the primal being that states it is both the Alpha and the Omega. The Ourobous,or Great Round, also carries with it the responsibility of being both the Womb and the Father and Mother representing the Universe and the symbol of eternal life. If we take a Jungian / alchemical approach, we see the glass sphere as the Great Round; the ouroboros or Great Mother that is self-sufficient, self-contained, and an aggregate of all forces, energies, and materials of the larger cosmos, ready to be differentiated and delineated at some future point of time and space. It represents time, birth, death, and resurrection prior to a genesis. One last symbol of interest is found in Ariel Golan’s Myth and Symbol: Symbolism in Prehistoric Religions. One’s initial argument could be made, Golan argues, that the herringbone pattern represents the skeletal form of a fish. Yet he goes on to persuade the reader that the herringbone pattern actually represented to unique cultures of humanity the symbol of wheat, or a possible outcome of the Black God, the god of vegetation. Wheat is an interesting possible interpretation, as wheat has typically been associated with birth, death, and resurrection. It has played multiple roles in various religions and mythologies, but is unique to the Osiris mythos, which, as well see shortly, also makes a possible appearance in the commercial. If the floor is indeed oak, I personally find that interesting, as it correlates well to the cosmogony briefly discussed previously. The image above, wherein the glass sphere is rolling along the floor, depicts a subset of three crosses embedded in windows in the main room. The glass sphere also appears to be traveling the length of five separate rooms or chambers. Continuing along this path of analysis, let’s breakdown the cross, the triad, and the pentad/pentemychos as symbols for a possible allegorical meaning. Returning again to a favorite subject of mine, the platonic solid known as the hexahedron, or cube, the Ikea commercial features a white, rectangular prism, or cuboid, that sits in a room from which the great, glass round originates. What can the cube possibly mean in this context? Returning to the Kubrick monolith…the monolith, as Cirlot’s A Dictionary of Symbols, is associated to the Egyptian god Osiris. Per an analysis of the Egyptian hieroglyphs, the monolith is a “determinative sign associated with the name of the god Osiris and signifying to ‘last.’” A symbol made distinct by light, the monolith, as identified with Osiris, is symbol of resurrection and life eternal. The celebration of the resurrection or reassembly of Osiris after his conflict with Set provided for the erection of the monolith. The monolith celebrates “unity counterbalancing multiplicity, fragmentation, and disintegration.” Cirlot also points out secondary meaning attached to the monolith, which include worship to the masculine, solar, and procreative principle. This one I found very interesting in respect to the analysis; at first, I wasn’t sure what the possible motive to include a spool of yarn/thread and a floating scarf or would be. Most first order summaries of the advert online go the simplistic route and state things like “the apartment has a poltergeist” or “an exorcism is needed after this advertisement.” Possible rationales, but I found another interesting, potentially useful allegory to this series of images. Aside from the idea of the scarf of the great mother goddess, Rene Guenon and Agnus Macnad, in their work The Symbolism of the Cross, discuss a slightly more abstract possibility regarding the outcome of weaving. The key to the analysis is the actual process of weaving cloth, and the use of warp and weft. Warp is defined as the “threads that run the length of the yardage and parallel to the selvedge. Weft threads run perpendicular to the warp threads, and run side to side (more info here). Sure, the floating scarf could be a poltergeist, but I tend to think of it is a symbol and outcome of multiple worlds, multiple states, and multiple times of a great illusion that is our material world in which the Great Round exists. And yet again, returning back to the Phereceydes cosmogony, the cosmic veil represents creation of the Earth; the veil represents the Harmonia and the connections that hold the Earth, the heavenly sphere, the starry firmament, and the primordial ocean together. Saturn? Set? The Great Serpent? The Tree of Life? Or something more primordial? This image is one of the more striking in the short video. At first, I thought the image to be of ill intent. A serpent-esque type form coils and breaks free from a plane below and into the plane above; a snake type shape that is rising from below as the sun sets in the West. One could probably argue that this is indeed the Great Serpent of ill-conceive, the Tower of Babel, Set/Typhon, or possibly the spinning Saturnian itself rising high into the heavens as the Solar God ceases to exist. It could very well be strangling a God of Life, the Sun, or even the symbol of the male reproductive spirit. However, before getting too far ahead of myself (which seems to always be the case in this area of study), and in keeping with the themes of this study, I want to begin this segment with the ancient symbol of the caduceus. Most books attempting to define the symbolic meaning of the caduceus focus on the Roman mythological thread, wherein the god Mercury (or Hermes), the messenger of the gods, intervened on fight between two serpents; Mercury therein through his staff into the conflict, and the two serpents reconciled and curled around the rod. In this context, we have instruction that the caduceus serves a symbol of moral balance and good conduct; the perfect construct for a rod of a god of commerce to represent commercial success. In Mackey’s An Encyclopedia of Freemasonry and Its Kindred Sciences, the caduceus is a symbol of immortality. As the herald’s staff, it is the attribute of a life restoring God. It represents a magic wand that was utilized by an ancient deity to bring the dead back to life; it is a symbol of resurrection. The most telling symbolism implied by this commercial, I believe, is the alchemical usage of the caduceus. The spinning of the double serpent conveys opposites that manifest of any dualistic possibility; “illness and health, good and evil, fire and water, binding and loosing-opposites ultimately to be united.”16 As Jung states, the caduceus is a symbol of the foreshadowing of coniunctio, as forms in the guise of animals who spend their time fighting and copulating The serpent’s ability to shed its skin and renew its apparent youth year over year attaches generative energy and immortality. And finally, returning to the idea of antiquity, Phoenicia, and Pherecydes, we have Zas, the last demiurge, completing his work on the universe by definitely organizing the universe. With the assistance of Harmonia and the Veil that carries with it the images of material existence, the universe is symbolized as an immense, rotating tree; a tree whose roots are fastened deep into the abyss, and whose extended branches bear the weight and structure of the firmament, holding all celestial and terrestrial forms in place. The tree, as depicted above, is representing the totality of the universe. With all that being said, what do I think the commercial is intending to covey to the viewer? To be honest, I initially thought the short video to be a parable of good losing to evil. There is the possible idea that Osiris has finally lost his eternal battle with Set, and in turn, the world ceases to exist and Set rules supreme with humanity damned to darkness, forever. As with most research in this community of researchers, this is most certainly a potentially more popular perspective. Who wouldn’t want to read about the ruling class using a popular, home furniture store advertisement to sneak in a message regarding their personal hope that Osiris finally loses, and the Great Serpent Typhon reigns supreme? While I’ll be the first to admit that, sure, this is a possibility, I would like to construct an alternate message that is potentially hidden beneath the images of the commercial. Deconstructing the images, we get the following : a white monolith or cubic formation releasing a glass sphere. The glass sphere is traveling through five chambers, with three crosses illuminated upon each chamber, shining down upon the glass sphere, upon a herringbone pattern oak floor, against one cycle of the sun rising and setting in the sky. As the ball continues to traverse, the sun sets and a) disintegrates the monolith and b) allows the caduceus to spring forth from below. Along the glass sphere’s travels, we see a spool of thread unwinding into the air, and floating scarf hovering over the oak parquet flooring. The glass sphere will ultimately continue to roll until enters the final, fifth room and encounters the chamber of the caduceus. That’s my take, at the very least. One of my problems is that I want abstract ideas and images to form into a nice, logical, and linear progression. My brain wants to make sense of the sacred, whether it be 2001: A Space Odyssey, Slaughterhouse Five, or even this Ikea ad, and wants to fit into some potentially long lost Mystery School train of thought. Is this commercial attempting to be symbolize alchemy, freemasonry, cosmogony, Jung, or something else? Is there even a true Mystery School that exists and portends to enable its adepts to know the true reality of this plane of existence, or is that some romantic notion that sits collectively in our minds? As always, I don’t pretend to know anything, but I do appreciate where the research takes me. And with that being said, what is your take on the commercial? I used the archetype of Pherecydes to attempt to put the symbolism into some context, but I would argue that his philosophy is in no way unique or intended (ie I’m sure there are other cosmogonies that fit much better to the symbolism analysed). What things have I missed, misinterpreted, or possibly spaced out on? I’d love to hear everyone’s take, and as always, collaborate on the material at hand. A1837-1883 LF. The beginnings of history according to the bible and the traditions of oriental peoples. : From the creation of man to the deluge. United States: Hardpress Publishing; January 28, 2013. Neumann E, Jung CG, Hull RFC, Hull FCR. The origins and history of consciousness, Vol. 42. Princeton, NJ, United States: Princeton University Press; July 1, 1992. Dourley JP. Jung and his mystics: In the end it all comes to nothing. London, United Kingdom: Routledge; April 9, 2014. Jung CG. The collected works of C.G. Jung: V. 13: Alchemical studies. Adler G, Hull RFC, eds. United States: Princeton University Press; February 1, 1968. Jung CG, Hull RFC. Collected works of C.G. Jung, volume 9 (part 1): Archetypes and the collective unconscious. 2nd ed. Adler G, Sir R F C Hull, eds. United States: Princeton University Press; March 1, 2014. Cirlot JEE, Spanish the, Sage J, Read H. A dictionary of symbols. 2nd ed. London: Routledge & Kegan Paul; November 17, 1983. Tresidder J. 1001 symbols: An illustrated guide to symbols and their meanings. London: Duncan Baird Publishers; August 21, 2003. Jung CG. The collected works of C.G. Jung: V. 9, Pt. 1: Archetypes and the collective unconscious. 2nd ed. Adler G, Hull RFC, eds. United States: Princeton University Press; August 1, 1981. Churchward J. The sacred symbols of Mu. United States: Kessinger Publishing; May 4, 2005. Rain MS, Zion C. Earth way: A native American visionary’s path to total mind, body, and spirit health. New York, NY, United States: Simon & Schuster Adult Publishing Group; August 1, 2003. Golan A. Myth and symbol: Symbolism in prehistoric religions. Israel: Schoen Books; January 18, 1991. Page A. Isis Code: Revelations from brain research and system science on the search for human perfection and happiness. United States: iUniverse; January 10, 2013. Taganov I, Saari V. Ancient riddles of solar eclipses: Asymmetric astronomy. Klaava Media; 2015. https://books.google.com/books?id=P69BCgAAQBAJ&pg=PT32&lpg=PT32&dq=pentad+golden+ratio&source=bl&ots=AY8vUfAjaa&sig=k7NcnpUEkVlHmb1MYDIVAty9GvY&hl=en&sa=X&ved=0ahUKEwjzvbjy8tXOAhVJKB4KHdV3DxEQ6AEIUjAJ#v=onepage&q=pentad%20golden%20ratio&f=false. Accessed August 22, 2016. Iamblichus, Lamblichus RW, Critchlow K. The theology of arithmetic: On the mystical, mathematical and cosmological symbolism of the first ten numbers. Waterfield R, ed. Grand Rapids, MI: Phanes Press,U.S. ; November 1988.
d’Alviella comte G, d’Alviella EG. Symbols: Their migration and universality. New York, NY, United States: Dover Publications; March 28, 2003. Your analysis here is absolutely beautiful! A beautiful story of creation. I absolutely love it. Thank you for writing this piece. Just a quick thought- the Rattan Coil- at first glance reminded me of a giant beanstalk. The Stalk had disrupted the “oak-herringbone” floor which in turn had connected the heavens and the earth. IKEA is of course Scandinavian, and in Norse Mythology you have the world tree- which this rattan coil resonates well IMO. 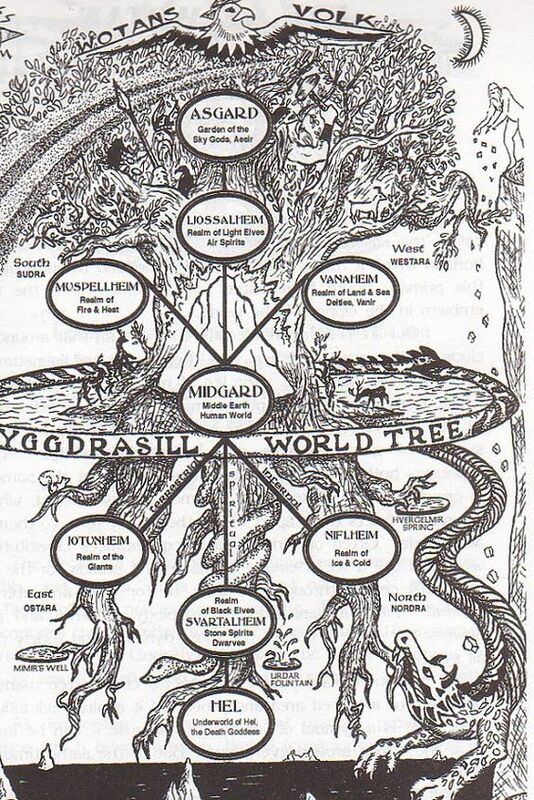 Most certainly I think that is at play here – maybe a spin on the wondrous tree of Yggdrasil? Also of interest is a green orb/sphere that passes near the spool – any thoughts on what that potentially was placed there for? Possibly the creation “spark” or energy? Not sure, I actually didn’t even notice it until you pointed it out! The Cosmic seed? Watching again- the more I think your analogy here is spot on. It is a cosmic creation story- the scarf could also be symbolic of the “fabric” of space and time- which was “created” by the weaving of the thread. Yggdrasil ties (or weaves) it together perfectly. Notes on the vid:Interesting that there is a BALL(earth) rolling over a flat plane and Icy white walls. The no trees in flat earth meme seems to be in there as well with the Giant tree thing coming out of geometric shapes on the floor. The melting white monolith symbolism is pretty dark to me. The crystal ball of course is a classic divination too. My first thought on the melting monolith was dark too, but thought I’d put a more cosmic/primordial spin on it that was in line with the Jung symbolisms, Pythagorean tetrakys, and the cosmogony at hand…but yeah, it is anyone’s guess at what was intended. At the very least, if it was intended to be dark, a positive interpretation can’t be too bad…maybe reverse the original inversion back to the original state of positivity in this little corner of the world wide web with a bit of spellcraft myself (just kidding, I think…)? Thanks as always, Jim, for the feedback!